Ooo, she whets our appetites! I’m gonna be ready to see the whole thing (thesis *and* presentation) when you’re done! It’s incredibly hard to find a good post about this online… Great work! Thanks for helping to mark and celebrate some of women’s boxing history. Thanks, Lisa! I have to say researching the topic is really fascinating. Now on to chapter two! Fascinating stuff! I would love to read the thesis too – can you put the presentation online, maybe here? Thanks, Niamh. I’ll definitely get the powerpoint up after the presentation on the 14th of October. 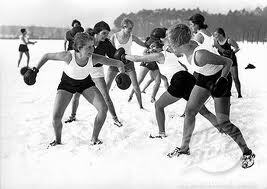 Hi, I have seen an important number of women boxing scenes in comic and B-films from 30s, 40s and early 50s. Usually, there are a closed connection between this kind of fantasy and the real life; therefore. It looks as there were many more action than we actually have on the records. I suspect there were matches; but, the information wasn’t on the news. What do you know about it ? Thank you so much for your comment. I have not come across too many reference although, most famously, there are images of Wonder Women, punching the lights out of bandits. Your raise interesting questions and I will write up a piece as I learn more. Well, one famous example : Wonder Woman vs Dalma. Comic Cavalcade # 12 (Fall 1945). Wonder Woman KO Dalma punching her out of the ring. Another example, famous in that age because Nyoka was a very popular: Nyoka vs White Princess. Nyoka, the jungle girl # 12 from Fawcett publicationes (October, 1947). Really is a fist fight; but, in previous scenes we did learn the white princess was a former woman boxer. 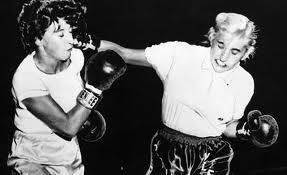 And other example : Doris Dawle vs Priscilla Beeswax, debutantes chanpionship, in a kind of comic scene from Kid Dixon. National Comic #19 (January 1942). Kid Dixon was a serie on the National Comic magazine and, later on this serie, we had a female boxer as a regular character. Thanks for all of this!! 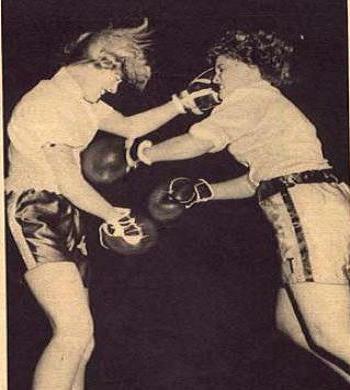 And by the way, check out today’s blog, Women Boxing in a Bookstore?!? (10/12/11) — I have a link to an amazing Popeye cartoon entitled “Never Kick a Women” at the bottom of the post! Sorry, I did forget maybe the most famous example : Diana Palmer, The Phantom’s girlfriend, and later his wife. The first scene in the first The Phantom’s daily strip story (February 1936) is Diana training boxing with a male sparring. I cannot thank you enough for these references. They will truly help me with the history section of my thesis paper — as well as the section on cultural representations. I truly had no idea. Also, the film “Las colegialas” (1946), starring Maria Elena Marquez, a very famoous mexican actress. It’s a film about girls in the school; It has a huge fist fight, Maria Elena vs the main bad girl (the most hard that I have seen in classic films), and later, the woman school director comment that she supports boxing for women. You will need register for download. By the way, some “Kid Dixon” episodes are not still avalaibles in the website. According the story, I suspect, it can have more women boxing. I suggest you ask the owners and the members of its forum about comics with women boxers, or fighting characters. Thanks for mentioning Gilrboxing in your blog! I am working on a film about female boxers and would love the chance to speak with you. Please email me at thewriteangelinla@gmail.com. « Women’s Boxing: Ana Julaton’s WBO Super Bantamweight title defense, tonight (9/30/11)!